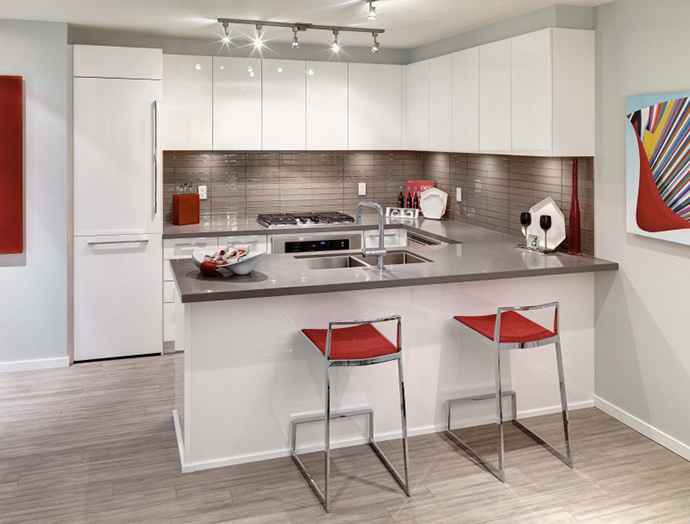 Penthouse Living in Metrotown at MODA by Polygon! Have you been waiting a long time for the exclusive launch of the upper level suites at Moda by Polygon in the Burnaby Metrotown real estate market place? We sure have, and guess what? Our favourite builder (Polygon) coupled with our favourite Burnaby neighbourhood (Metrotown) now launches the new and luxury Burnaby Moda Penthouse suites! Conveniently situated within seconds (and just across) from Metrotown and Metropolis, Moda Burnaby penthouses provides a once-in-a-lifetime opportunity to own an executive residence high atop one of the most boutique and sought after high-rise towers in the area. Of course, Metrotown itself features the largest shopping and entertainment complex in all of British Columbia, so home owners of these executive Burnaby Moda Penthouses will have easy access to mass transit, the SkyTrain Line, numerous shops, dining, recreational options and local services at your finger tips. Stylish Burnaby Penthouse living at Moda Metrotown will feature open plan floor plans designed to capture the stunning panoramic views from the downtown Vancouver skyline to the North Shore mountains and beyond! Some other thoughtful features of the new Polygon Moda Burnaby penthouse collection of suites includes two generous outdoor living spaces for entertaining and relaxation any time of year. All of the Moda penthouses by Polygon will also have air conditioning for year round comfort, large windows and airy living spaces with over height ceilings for a truly comfortable living experience. As well, all the latest designer finishes, sleek brand name appliances and quality craftsmanship are standard in each and every home that will be ready for completion and move-in this year in December 2014! The new Burnaby Moda penthouses are brought to you by POLYGON MODA TOWER LTD. For more information, please see a sales representative at the presentation gallery or visit the Polygon web site at www.polyhomes.com today to check out more about the executive Moda penthouse collection or other Polygon developments in the Lower Mainland. There are 2 draft floor plans for the executive penthouse collection at Moda by Polygon. Both are superbly designed for you in mind and will present commanding views of the North Shore mountains and/or cityscape depending on your preference. Of course, you can have it all too! The first of the 2 Moda penthouse floor plans is Home 3701 which presents 2 bedrooms and 2 full bathrooms with approximately 1,166 square feet of living space. Some of the highlights for this particular unit include: over height ceilings and air conditioned interiors, thoughtful layout to capture panoramic views from the expansive living space and gourmet kitchens with sleek finishes and brand name appliances. The two generous decks will create an easy indoor/outdoor liveability unlike many other comparable developments. These executive Burnaby Moda penthouses will also feature commanding views and spacious bedrooms with beautifully furnished ensuite with a soaker tub and walk in shower (separate). Unit 3701 is priced from just $888,000. Alternatively, you may choose Unit 3703, which is also a spacious 2 bedroom and 2 bathroom layout with 1,148 square feet of living space. Much like the other Metrotown Moda penthouse layout, Unit 3703 will also have over height ceilings, expansive windows, great views and air conditioning for a year round comfortable climate. The gourmet kitchens will feature the same high-standard features and finishes including stainless steel appliances, premium floors and counters and built-ins. All homes come with in-suite laundry closets with stacked washer and dryer and the two full bathrooms are beautiful. The main bath has a shower/tub with single vanity while the ensuite bathroom has double vanities and a separate walk in glass enclosed shower with a deep soaker tub. Again, the new Polygon Moda Burnaby penthouse suite will have two generous decks offering great outdoor living spaces and different vantage points/views in various directions. This penthouse floor plans is priced from $788,000. The executive collection of Burnaby Moda penthouse suites is not just about stylish homes, but it’s also about architecture, location and awesome amenities. We’ll try to explain each of these incredible features about the Moda by Polygon development below. When you arrive, you’ll see the incredible landmark architecture by IBI/HB Architects with its one-of-a-kind luminous art wall that interacts with pedestrians as they walk by. 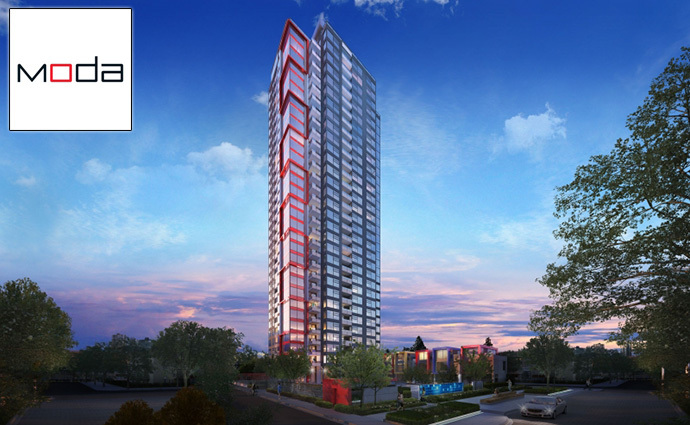 The 32 storey high-rise landmark is definitely an iconic building in the fast growing Burnaby Metrotown neighbourhood and will feature a soothing water feature outside the grand entrance lobby to welcome you home. From the dramatic canopy and double height glass entry doors, everything about the new Metrotown Moda condo tower exudes luxury and prestige, but in an understated way. There is a virtual concierge upon your arrival in addition to a great locale along the Beresford Art Walk, a renovated streetscape graced with unique and professional landscaping, furnishings and the Art Walk itself which is an interactive light wall exclusively designed for the Moda condo tower. On-site, home owners at the executive collection of premium Burnaby Moda penthouses will have access to over 1,900 square feet of amenity spaces that include a Fitness Studio (private air conditioned workout facility with weight training gear, cardio, yoga space and televisions). In addition, there will be a central lawn area for relaxing and chatting with friends. The Metrotown Moda condo tower will also present an indoor social clubhouse lounge where you have access to WiFi, comfortable seating and a pool table. Last but not least, the new Moda Metrotown condos will have a resident manager and a virtual concierge to ensure that everything runs smoothly and your safe and sound with nothing to worry about. The electronic security systems are extensive and include video enterphone at lobby, visitor parkade enterphone, and security cameras in the main residential lobby and elevator area A key fob proximity reader allows discreet and convenient personal access to the entrance lobby at the Burnaby Moda Metrotown condo tower with secondary lobby access for the resident parking from both parkade levels. All homes have front doors with deadbolt lock hardware. 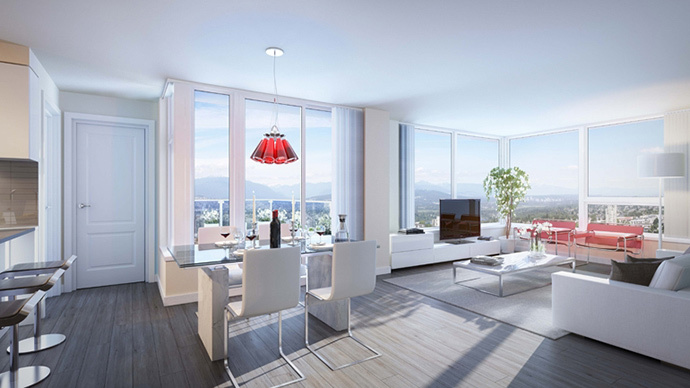 In addition, the new Metrotown Modo penthouses in Burnaby will feature over height nine foot ceilings (higher than other floors) in addition to full air conditioning (again, a penthouse feature). Other optional upgrades include a storage locker and wireless security system for other level suites. There’s New Generation rain screen glazing system for enhance weather protection and durability in addition to fire sprinkler system protecting all common areas and your home. The new Metrotown Moda Burnaby penthouses come with a Travelers Guarantee Company of Canada 2/5/10 year home warranty.